Beyond disciplinary experience and achievements, success in any career requires leadership and interpersonal skills, effective speaking and writing, the ability to engage and network, and wisdom in confronting the societal implications of your work. These pages introduce you to resources at UC and elsewhere that will give you these skills! Graduate students will find opportunities to build their skills as teachers, researchers, scholars and professionals in a variety of contexts at UC. The Center for the Enhancement of Teaching & Learning (CET&L) and the Graduate Association for Teaching Enhancement (GATE) offer workshops on classroom pedagogy and innovation, assessment, scholarship of teaching and learning, course design, accessibility and gateway instruction. The Graduate Student Expo is an annual, adjudicated event that showcases graduate student research, scholarship and creative works. All participants receive judge feedback. The Preparing Future Faculty graduate certificate program provides instruction in modern teaching and learning and offers rich mentoring experiences to strengthen career skills. The Teaching Effectiveness course covers the theory and practice of effective, learning-focused teaching at the college level. Prepare for an academic or professional career. The Academic Job Search course guides students through the entire academic job search and hiring process, from deciphering job postings to negotiating salary and benefits. The Academic Writing Center offers workshops and online resources related to preparing written materials for the academic and professional job search. The Division of Experience-Based Learning and Career Education provides career services that can help you at every stage of the job search with career coaching, a job search board specifically for UC students and alumni, resume critiques, practice interviews and more. Individual Development Plans (IDPs) provide a strategic tool to guide students through career and professional development. Helpful templates are provided to guide students through creating a personalized plan. Many workshops offered by the Graduate School and other organizations prepare students for the job search. The Start Smart workshop, offered every fall and spring, teaches graduate students to negotiate salary and benefits. How to Get Hired, offered annually, provides students with best interview practices. Excellent oral and written communication skills are valued by academic programs and employers alike. Take advantage of these free resources at UC to improve your communication skills. The Academic Writing Center offers free writing assistance. Tutors and workshops provide specialized assistance with the writing process and with crafting academic and professional documents. The Center for English as a Second Language (CESL) provides ESL courses to international students. These courses focus on reading and writing skills, oral communication and culture awareness. 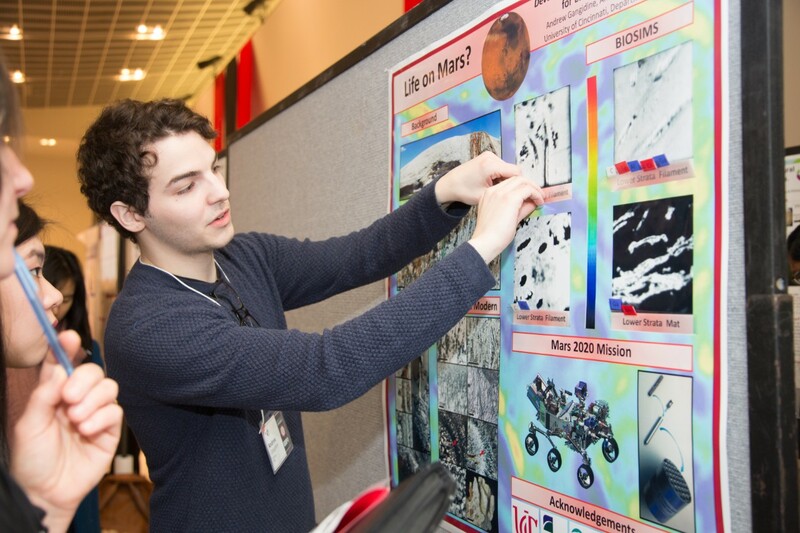 The Graduate Student Expo encourages students to practice their oral research communication through poster presentations and the Three Minute Thesis competition. All participants receive feedback and suggestions for improvement from judges. The Interdisciplinary Dissertation Writing Workshop course is extremely beneficial to students in all stages of thesis or dissertation writing. Writing Accountability Groups (WAGs) provide a structured writing schedule with an accountability system to keep students on-track and productive with lengthy scholarly writing projects. Get involved with the UC community, Cincinnati community and your future profession's community. Leverage community involvement for leadership and networking opportunities. UC student organizations offer opportunites for leadership, academic development, professional development and networking. UC's graduate student government (the GSGA and GSAs) provides many opportunities for leadership and service to the graduate student community. The Center for Community Engagement connects students with volunteer and service opportunities in the local CIncinnati community. The Annual Student Leadership Conference, hosted every fall by Student Activities & Leadership Development, focuses on individual and group development to support student leaders in their positions and to provide personal and professional development experiences. Travel awards, funded by the GSGA, provide graduate students with financial support for attending academic conferences and research-related workshops and seminars. These events often offer excellent networking opportunities.